Being able to view your home on demand has its ups and downs. The Nest Cam in action. AT WHAT POINT does technology become too invasive? The movement of smart items is slowly building up and with more arriving on the market, so too will the questions of what it does and what it gathers about you. A security camera probably isn’t the first thing you’d think of giving smartphone capabilities, but it’s something Nest has done. While it started off with the Nest Thermostat and released a smart smoke detector, its latest move was into the world of smart security. 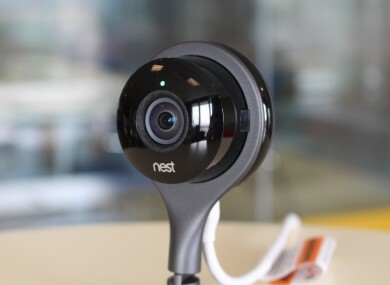 The Nest Cam is a small, inconspicuous device, designed to be both easy to set up and use. We’ve been testing it out for the past fortnight and here are our experiences from it. If there’s one thing Nest is great at, it’s designing easy-to-use products. All you get in your box is the camera, a cable, plug, and some extra bits if you want to perch it on a wall. If not, you just find a suitable place – a high shelf for example – and place it there. Connecting it to your computer or laptop takes a few steps, but we did have trouble when using only our smartphones. While it recognised the QR code at the back, it had difficulties connecting when at the final step. Thankfully, you can install it through your PC – the cable doubles up as a USB port which is now the standard – and that is also a straightforward process. Once you set up an account and say the type of room it’s in (mainly for those with multiple cameras), you’re set. The Nest Cam without the cable. The first thing that will strike you is the quality of footage it captures. The camera has a wide-angle lens so it has a great chance of capturing everything in a room (provided you set it up in the right place). There is something compulsive about checking your stream to see what’s happening and even if you set it up in a busy place, the push notifications only happen when someone comes into the room. It will also save additional snapshots in case you need to view them later. I received notifications whenever a new person entered the room (usually my housemates) and it saves a few seconds of footage that you can check back on later. The footage is delayed by two to three seconds, but that is the norm with all livestreaming services. And then there are the settings. Much like the Nest Thermostat, there’s are home and away options, the latter turning on your camera when you’re out and about, or you could just schedule specific times for it to be on. There’s a nightvision mode and a talking mode so you can talk to anyone in the room. There’s no way to hear what they’re saying though so if you’re trying to communicate with someone, you’ll need them to do some kind of physical gesture so you know they got the message. The biggest draw, much like its thermostat, is convenience. The app and site are easy to use and it only takes two taps/clicks at most to get to where you want. The Settings screen allows you to get more out of the Nest Cam. Nest automatically streams footage at 720p, but you can change it to 320p or 1080p if you want. Putting it in HD may sound a bit much but it becomes useful when you start using the enhance option to make out specific details. The stream is set to private by default, but you can make it a public feed if you wish. This is more useful if you want to showcase an event to your friends instead of streaming something to the world. The obvious catch to this is how much data it uses up on your phone. To be fair to Nest, it does manage to keep data usage down to a reasonable level but it’s uses up the same amount you would expect if you were watching Netflix or YouTube on HD. It’s better to use the stream as a quick reference, and if you need to view for longer, you can just reduce the image quality or connect to WiFi. With the camera alone, you can livestream footage, but if you want to save and review moments, you’ll have to pay for a Nest Aware subscription. You can pay for video history for up to 10 or 30-days and those plans cost €10 and €30 per month respectively. This ultimately depends on what your priorities are, but some may find the cost a little much. You do get a 90-day free trial to begin with so you will have enough time to figure out if it’s something you want, although it loses some of its more useful features if you decide against it. The other drawback is if one person having access to it, you begin to feel a little invasive. It’s a bit strange to see footage of a housemate or family member (or yourself) walk into the room, but its usefulness depends on where you place it and who’s living in your home. If you have a family, it’s useful if you’re trying to keep an eye on your child while you’re in another room. For everyone else, you probably want to set it up in a location that isn’t invasive like the hallway. But should you get one? That is a tricky one to answer. For some, the idea of having HD footage will be useful, if a little bit over the top, but it serves its purpose. When we reviewed the Nest Thermostat earlier this year, we mentioned it would be suitable for those with a specific schedule and you get the same feeling with the Nest Cam. Still, you’ll have a decent idea of whether you’ll find this useful or not. If you don’t mind paying a little for it every month, then there are enough useful features there for you to make it worth your while, but for some, it may be overkill. - Small and inconspicuous. You can place it almost anywhere. - Great range of options yet simple to use. - Footage quality is sharp. - The ability to revisit snapshot footage based on sound or motion is useful. - 720p/1080p footage can eat up your data quickly. - You can feel a bit odd looking through footage featuring family members/housemates. - The monthly fee to save footage might be a bit high for some. Email “Here's what it's like to live with a livestreaming security camera”. Feedback on “Here's what it's like to live with a livestreaming security camera”.